At Wit's End is a straightforward summary of leading advice for caring for someone with Alzheimer's disease, written without technical jargon and impractical nuance. About 33 percent of the population eventually will provide care for someone with Alzheimer's. The strain of caring for a loved one with this disease can be enormous, yet the reward of enhancing a loved one's quality of life is beyond measure. So, where to begin? Many books delve into other specific areas of Alzheimer's care, emphasizing the financial and legal challenges, as well as myriad medical treatment needs of those experiencing the disease. Unique among these offerings, At Wit's End explains the psychiatric and psychological aspects of Alzheimer's, and does so in a holistic and practical manner. Kraus focuses on the whole person across his or her full social, psychological, physical, and spiritual life to provide as complete a picture as possible of the changes that are in play. With this broad, thoughtful, and grounded approach, family members, clincians, and caregivers are better able to discover and make wise choices from a wealth of effective interventions in all areas of care. It also allows them to care for themselves and their families in the dynamic, supportive care process. Find out how Alzheimer's can be distinguished from normal aging and other diseases that mimic its symptoms; how the disorder affects changes in functional abilities and how the daily competence of a person with Alzheimer's is viewed by psychiatric and legal communities; how rational thinking is distorted, leading to a wide array of unusual and often uncharacteristic behaviors like agitation, impatience, wandering, and inappropriate expressions of sexuality; and what medical, psychiatric, and psychological treatments are available to help. 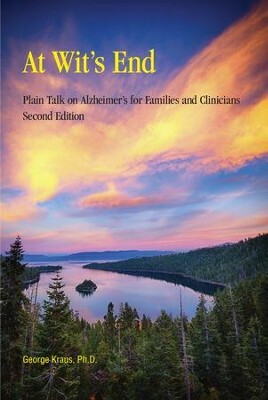 At Wit's End gives families, clinicians, and caregivers a new outlook on Alzheimer's disease. George Kraus is a psychologist specializing in the care of the elderly, especially those suffering from Alzheimers disease and other dementias. He is on the faculty of John F. Kennedy Universitys Department of Clinical Psychology (Pleasant Hill, California) and is in private practice. He has published in a variety of professional and online journals including Clinical Psychology Review, Small Group Research, Psychological Reports, Small Group Behavior, and Psychotherapy.net. I'm the author/artist and I want to review At Wit's End: Plain Talk on Alzheimer's for Families and Clinicians, Second Edition - eBook.